Stacy M. Schwartz is a partner in the Fort Lauderdale office of Lewis Brisbois and a member of the Complex Business & Commercial Litigation Practice. Her practice focuses on commercial business disputes, intellectual property and technology matters. Ms. Schwartz is an experienced litigation attorney representing clients in state and federal courts nationwide. Ms. Schwartz has represented clients in various industries, including education, government benefits, marine, construction and technology. She advises a wide range of clients including individuals, small businesses and large corporations on their business matters. Her representation is tailored to the needs and goals of each client and involves advice and counsel to avoid litigation, seek resolution of litigation or pursue and/or defend litigation. Ms. Schwartz also consults with clients on obtaining, protecting and maintaining their intellectual property rights, prosecutes trademark applications and handles matters before the Trademark Trial and Appeal Board. Prior to entering private practice, Ms. Schwartz served as an Assistant Attorney General from 2001-2003 in the Civil Litigation Division of the Florida Office of the Attorney General. Ms. Schwartz is trained and certified as a Florida Supreme Court Certified Circuit Court Mediator. Ms. Schwartz is available to assist parties seeking to narrow their disputes or achieve full resolution of their disputes pre-suit or pre-trial. Ms. Schwartz is rated AV® Preeminent® by Martindale Hubbell. She was named a Florida Rising Star by Florida Super Lawyers Magazine from 2010 – 2015. In 2014, Ms. Schwartz was recognized as one of 40 attorneys in the community by the Daily Business Review as a South Florida Rising Star. Ms. Schwartz was designated a Top Up and Comer by South Florida Legal Guide in 2015 and 2016 and a Top Lawyer in 2017 and 2018. Ms. Schwartz is a past president of the Broward County Women Lawyers’ Association (BCWLA), the Broward County Chapter of the Florida Association for Women Lawyers (FAWL). 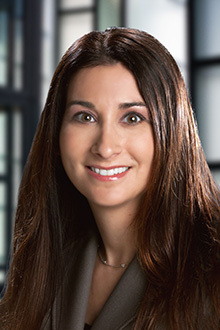 Ms. Schwartz previously served as a Board Member of the Stephen R. Booher American Inn of Court, the Broward County Chapter of the American Inns of Court. Ms. Schwartz has received many distinguished appointments. She is a Class III Fellow of the Florida Bar’s prestigious Leadership Academy. In 2014, Ms. Schwartz was appointed to the Seventeenth Judicial Circuit Professionalism Panel and served a one year term. Ms. Schwartz previously served a three year term on Seventeenth Judicial Circuit Grievance Committee “I”, completing her term as Chair in 2011. Ms. Schwartz’s activities include commitment to the training and advancement of young lawyers in the legal profession. Ms. Schwartz has served as a faculty member in NITA’s Deposition Skills Program at the Shepard Broad Law Center. Ms. Schwartz also serves as an Adjunct Faculty Member of the Shepard Broad Law Center. Ms. Schwartz participates in a variety of community activities. She is a past Board Member of the Broward County Gator Club, a Chapter of the University of Florida’s Alumni Association. She is a member of Riverwalk Trust and the Victoria Park Civic Association. Ms. Schwartz is a volunteer and supporter of PACE Center for Girls. In 2016, Ms. Schwartz was recognized with a “Glammy Award” from Glam-a-Thon, Inc., for her dedication and fundraising efforts benefitting breast cancer patients in Broward County.